Setting up an Excel spreadsheet to import data into your model is easy when you’ve got just a few variables but it can get cumbersome when you’ve got lots of variables, especially if some of them are arrayed. 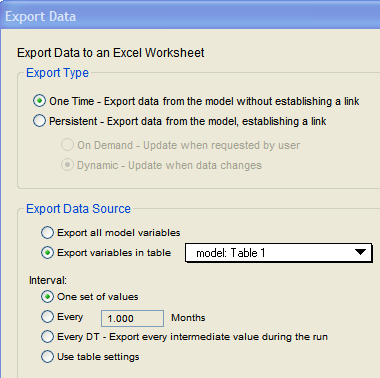 If you want to avoid lots of copying, pasting, and switching back and forth between your model and Excel, we suggest using the export data feature to set up your data import spreadsheet. In your model, create a Table with all of the variables that you want to import data to. From the Edit menu, choose Export Data. The Export Data dialog will appear. Under “Export Type”, select One Time. 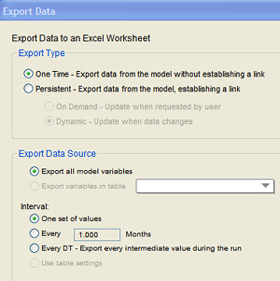 Under “Export Data Source”, select Export variables in table and select the table that you created in Step 1. Under “Interval”, select One set of values. Under “Export Destination”, Browse to an empty Excel file and Worksheet Name that you have created for your data import. Select the “Data Orientation” that you prefer. Voila! Your import sheet should be all set to enter data values for each of the variable names AND it will be in the correct format.